Turning ideas into reality is part of the learning experience at INTI, where students are inspired to experience the world in different ways, make their own discoveries, think for themselves and discover their true potential through an education that empowers learners. 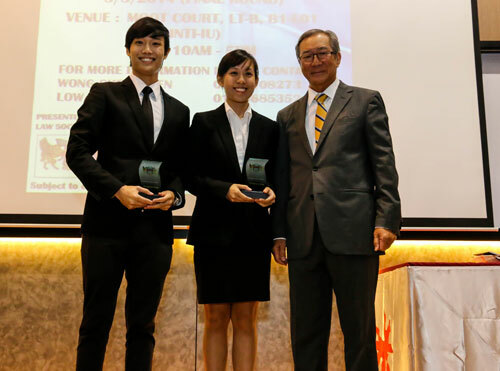 For law students Wong Chee Chien and Chin Min Shuen, having witnessed a national mooting competition earlier on and the realization that a similar event on their own campus would provide immense learning opportunities to participants had motivated them to propose and organize their own mooting competition. Tan Sri James Foong (right) with the competition’s eventual winners Ong Johnson (left) and Liew Shu Min. The inaugural 2-day competition initiated by Chee Chien and Min Shuen, and supported by INTI Law Society and the Faculty of Business, Communication and Law at INTI International University, saw over 20 law students debating their cases before an impressive lineup of judges comprising members of the Bar Council of Malaysia, LawAsia and academics from the law faculty of the National University of Malaysia. Retired Federal Court judge Tan Sri James Foong and former justice of the High Court Dato’ Syed Ahmad Idid also served on the moot bench at the finals of the competition. “Mooting is an essential activity for all aspiring lawyers and is compulsory in most established law schools. It ensures that law students are properly groomed before appearing in real courts of law. We invited legal practitioners on board to deliver judgment, and students were tested on their legal research and thinking, analysis, teamwork and most importantly, advocacy. It is my sincere hope that this would lead to INTI’s participation in the 2014 LAWASIA International Moot Competition. Having our own competition at INTI is also a good start to establishing a mooting tradition on campus,” said Chee Chien who plans to complete his law degree at Cardiff University in the UK. “I am very proud of our students who have undertaken the challenge of hosting this event. It gave them a feel for what awaits them upon graduation. They were able to work on their presentation skills and also put to use the legal terminologies we constantly apply during the course of their study. By starting them on this journey, I believe these students will be able to go further by participating in more regional based competitions where they will compete with other law students whom they will eventually meet in similar circles upon graduation,” shared Rathakrishnan Ramasamy, advisor for the competition from INTI’s Faculty of Business, Communication and Law and a former law practitioner. Beyond developing their skills through organizing and participating in the competition, the students were able to network with key people from the legal fraternity and learn to appreciate the opportunities and challenges presented in the legal profession. INTI’s UK Degree Transfer Programme (Law) is designed to provide strong fundamentals that cover the core subjects of legal study and a selection of optional subjects to suit individual interests and career plans. Students are guided on the techniques of legal research and writing, and will be able to access extensive and complete Law resources via electronic law databases, law journals and reports and other relevant texts. The programme offers flexibility to transfer to reputable universities and highly ranked law schools in the UK and Australia on a 1+2, 2+1 or 2+2 arrangement. Curriculum and assessment are subject to stringent quality control by an internal moderator from the University of Leeds and an independent external moderator from the University of Lincoln ensures quality within the programme and determines students’ grades. For more information on the UK Degree Transfer Programme (Law), please contact 06-798 2000.